My kids have always loved to go to the library and check out a big stack of books that relate to the current holiday or season. Valentine's Day of course is no exception, so here are some of our choices for great Valentine's Day kids' books, featuring a mix of new releases and some old favorites. 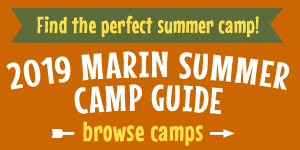 Find them at your local library; the links on each title take you to that book's listing on the Marin libraries MARINet website. Love Monster is a slightly hairy monster who finds it hard to fit in with the cute and the fluffy in Cutesville. Follow his adventures as he sets out to find someone who will love him just the way he is. For ages 2 and up. In Llama Llama I Love You, little llama shows his friends and family how much he loves them with heart-shaped cards and lots of hugs. What could be sweeter than Llama Llama on Valentine's Day? Ages 3 and up. One winter day, the postman delivers a mysterious package with a big pink bow to lonely Mr. Hatch. "Somebody loves you," the accompanying note says. Mr. Hatch wonders, who that somebody could be, and eventually discovers who his secret admirer is, much to his surprise! For ages 3 and up. The very hungry caterpillar displays its love for the reader as the cherry on a cake, the apple of an eye, and the bee's knees. Perfect for that someone special any day of the year! Ages 3 to 5. Moose is having a Valentine's Day party, and all his friends are so excited! Everyone except Groundhog, that is. If Groundhog sees his shadow outside, he'll hide in his hole for six more weeks and miss the party! This heartwarming picturebook by the author of Vampirina Ballerina, with illustrations by Christopher Denise, is sure to be a hit, whether readers are bursting for spring or snuggling up for six more weeks of winter. Ages 3–6. This delightful follow-up to Fright Club gives readers a glimpse into the heart of Fran (Frankenstein). When his friends catch him making a valentine, at first they can't figure out what he is doing. Bunny is the only one who recognizes the heart for what it is, and when she announces it to the others, shock and horror ensue. Ages 3 to 6. Little Duck and all of her friends on the farm celebrate Valentine’s Day by inviting a newcomer to join in the fun in this charming addition to the award-winning Click, Clack series from the New York Times bestselling and Caldecott winning team who brought you Click, Clack, Moo and Click, Clack, Surprise! Ages 4 to 8. Valentine's Day skeptic Pete the Cat learns how special the holiday can be with a little help from his friend Callie. For ages 4 to 8. One day it rains hearts in a most unusual downpour! Fortunately, Cornelia Augusta is there to catch them. Each heart is special in its own way, and Cornelia Augusta knows exactly who to send them to. For ages 4 and up. Join Jasper the bunny as he steps out on a snowy Valentine's Day to search the forest valley for a special gift. This is debut picture-book by David Petersen, the Eisner Award–winning creator of Mouse Guard. For ages 4 to 8. Splat the Cat has a special valentine for a certain someone in his class: Kitten, who Splat likes even more than fish sticks or ice cream. But Kitten doesn’t seem to notice him at all. And of course Splat’s rival, Spike, likes Kitten, too. Will Splat’s heartfelt valentine win Kitten’s paw in the end? For ages 4 to 8. A valentine is all about sweetness and gooey love, but this book is about all the things you might give someone that are not exactly gifts, but that show that you care for them and for what they think—but is not that a kind of love? For ages 5–8.